Today we used an empty baby wipes box to do some posting. 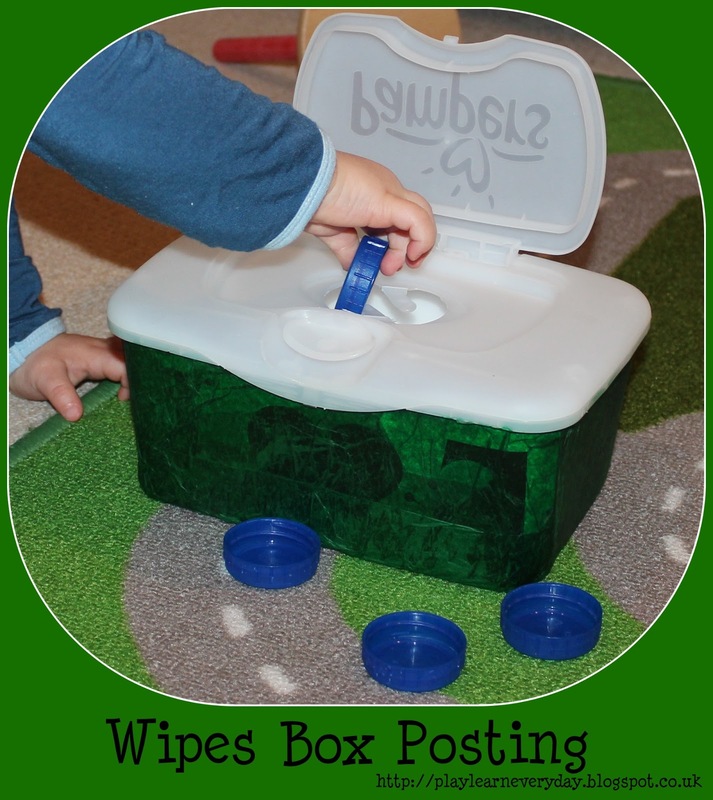 The first thing we did was decorate the wipes box with all sorts of stickers (but Ethan kept peeling them off, so it looked a mess and I ended up covering it with tissue paper while he napped). We had been collecting milk bottle lids, and they were the perfect things to put in our box. The box has a funny opening, so it was a challenge for Ethan to figure out how to put the lids in. Once he got it he was happily putting the lids in and then trying to figure out how to open the box to get them back. A great activity for Ethan's Physical Development as he had these challenges to his fine motor control. I also counted the lids as he put them in, and could further develop the activity by putting numbers on the lids to make it more of a Mathematics activity as well. If you're in North America they're quite easy to find, but if you're in the UK (like me) unfortunately they're not! I think that I was lucky once and saw them in a pound shop so I bought up loads, but otherwise you can order wipes in them from Amazon http://amzn.to/1BeduOz but it is a bit pricey for a wipes box to be honest. I have seen them now and again in the big grocery stores, so I guess just keep your eyes peeled for them. Sorry I couldn't be more helpful (I tend to bring a few back from Canada when I go).